RRB NTPC Previous Year (03/2012) Cut off Marks: TA, CA, ASM, Goods Guard 2nd Stage Exam Cut off: Looking for Previous year final cut off Marks of Railway Non Technical Stage II Exam? 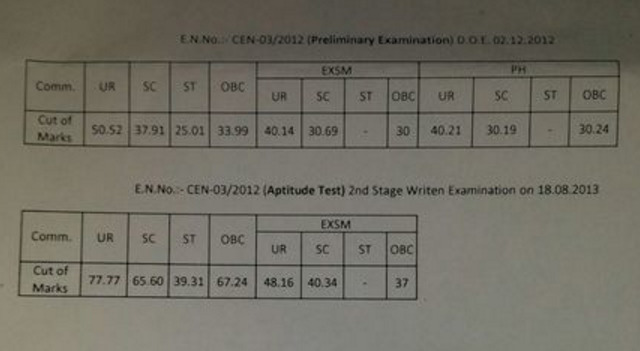 We have finally managed to bring you candidates RRB CEN 03/2012 (NTPC Graduate) exam cut off marks. We have got too many question regarding Railway Previous Year cut off marks. 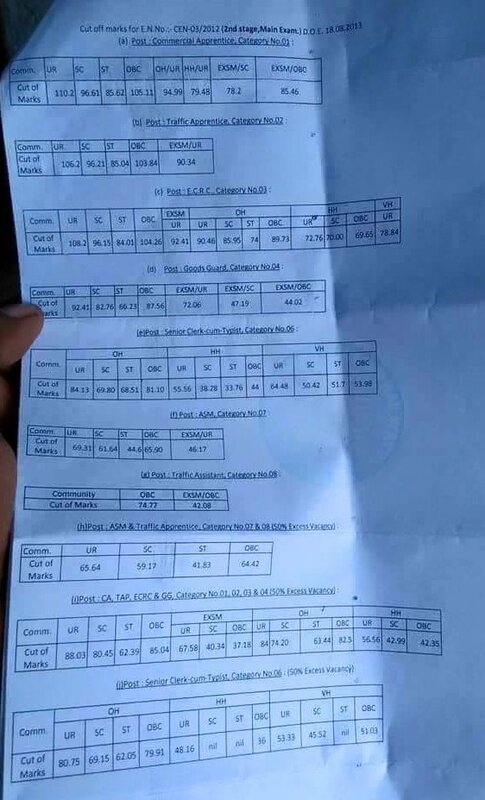 Check out the table given below to understand RRB Marking scheme for Railway Non Technical Mains exam. RRBs Previous year cut off Marks for many other boards added to the list. These cutoff will help you candidates deciding final cutoff of NTPC 2017. The Railway Recruitment Boards (RRBs) have announced Railway RRB NTPC Final Result. 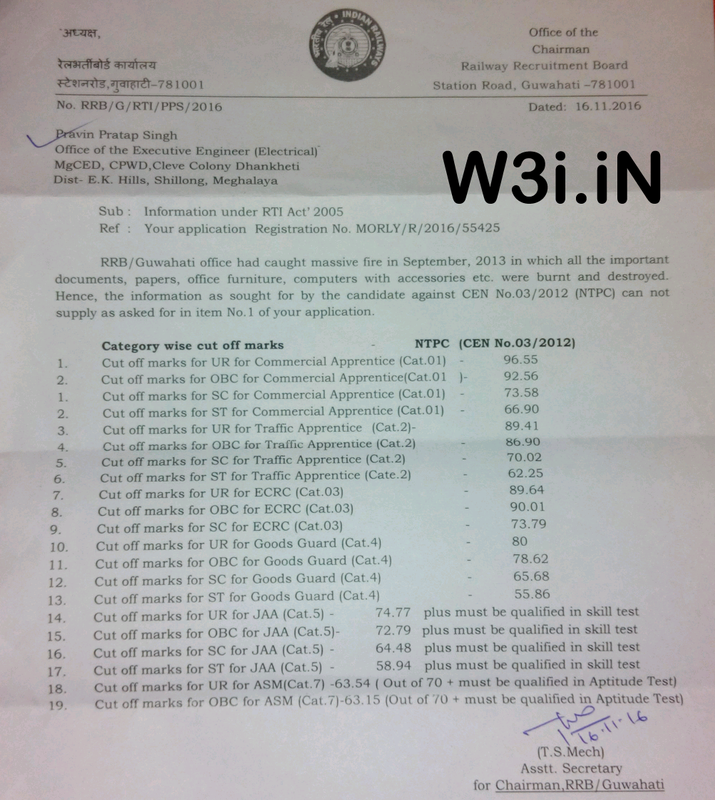 To help you knowing the cut off marks trend of RRB NTPC 2nd Stage Mains exam, we have brought you All Railway Board non technical exam previous year (03/2012) cut off marks. The Railway Recruitment Board (RRBs) has conducted RRB NTPC Online mains exam on 17, 18 & 19 January 2017 for recruiting ASM, Goods Guard, TA, CA, Clerk-Typist vacancies in railway. We have listed here almost all Railway Division/ Board such as RRB Allahabad, RRB Mumbai, RRB Secunderabad, RRB Chennai, RRB Patna, RRB Muzaffarpur, RRB Ajmer, RRB Bangalore, RRB Bhopal, RRB Chandigarh, RRB Kolkata, Ranchi and other railway boards (RRBs) previous exam cut off marks. 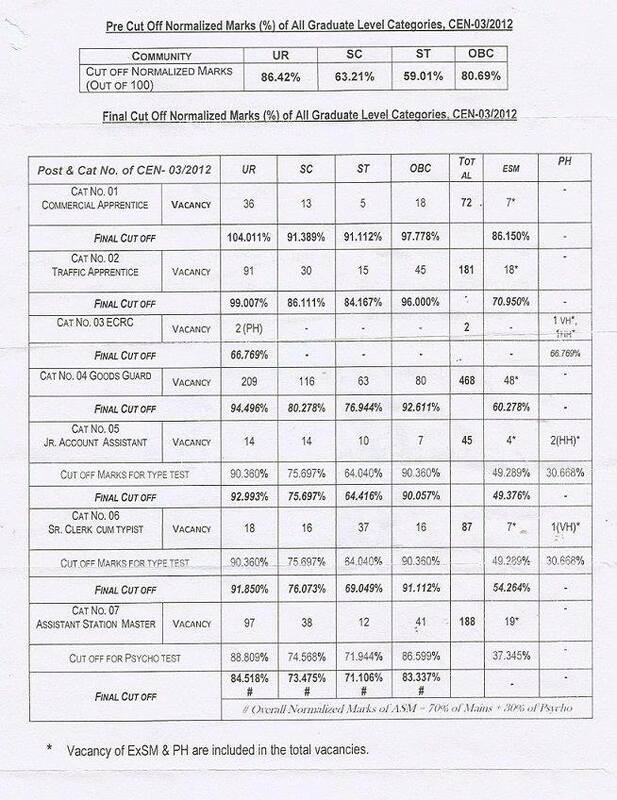 Check RRB NTPC Expected Cutoff Marks. RRB NTPC Typing Test Instructions for Sr Clerk & JAA Posts. Note: Vacancies in 03/2012 was as follows: ASM - 259, JAA - 11, Sr. Clerk - 13 & Goods Guard: 46. RRB NTPC Revised Vacancy for Railway ASM, Goods Guard. 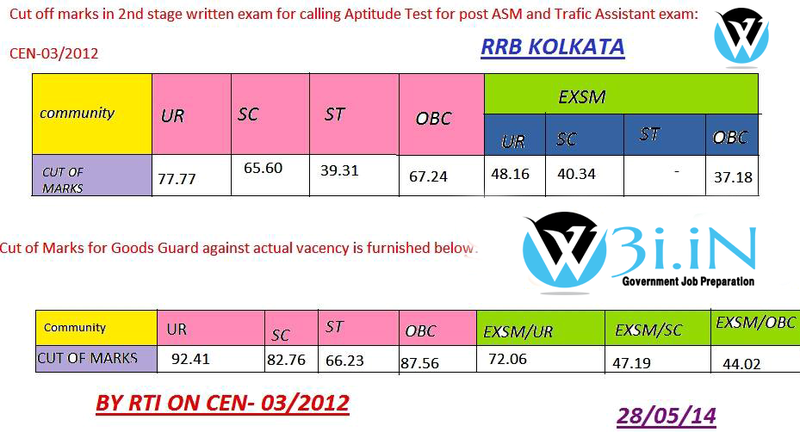 Check Railway Guwahati Board NTPC 2nd stage exam cutoff markss of CEN 03/2012 exam. 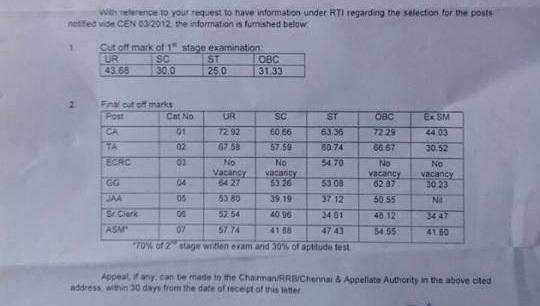 Check 1st stage and final cut off Marks of RRB Chennail (CEN 03/2012) NTPC Exam. RRB NTPC 3rd Stage Stage Test in March 2017. 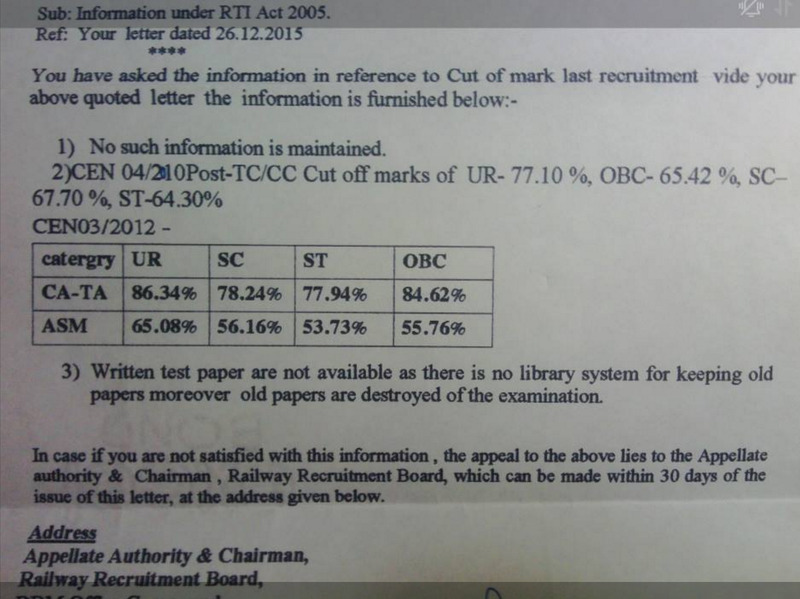 Note: Overall cut-off Marks for each Railway Recruitment Board (RRBs) were not same. 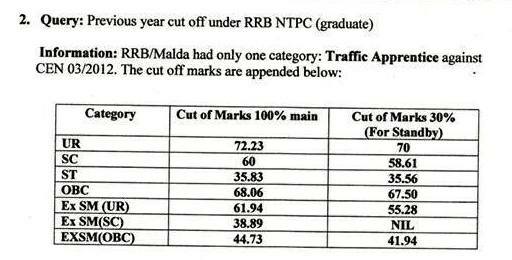 We have just brought cut-off marks of some of the Railway board to help candidates about RRB NTPC Normalize Cut-off marks. There will be similar cutoff this year too. The only thing candidate should keep in mind this time RRB NTPC exam cutoff is out of 120 Marks. RRB NTPC 03/2015 Selection Faq. 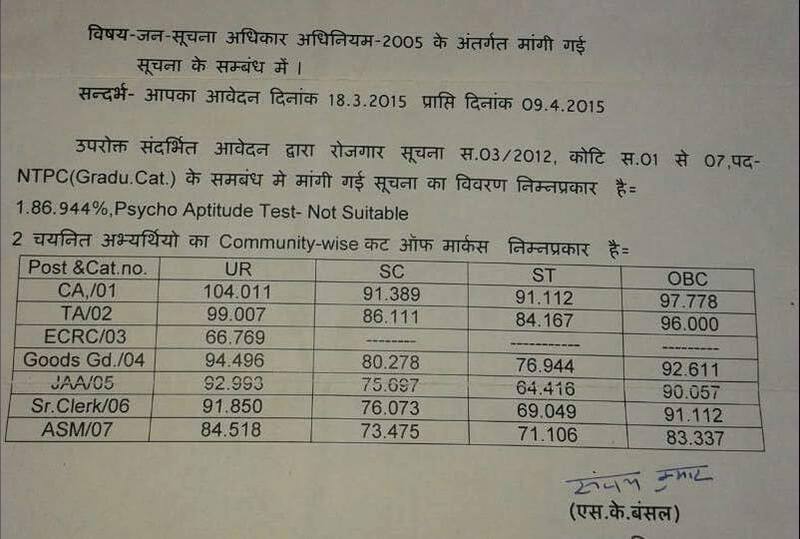 RRB NTPC Psycho/ Aptitude Test. 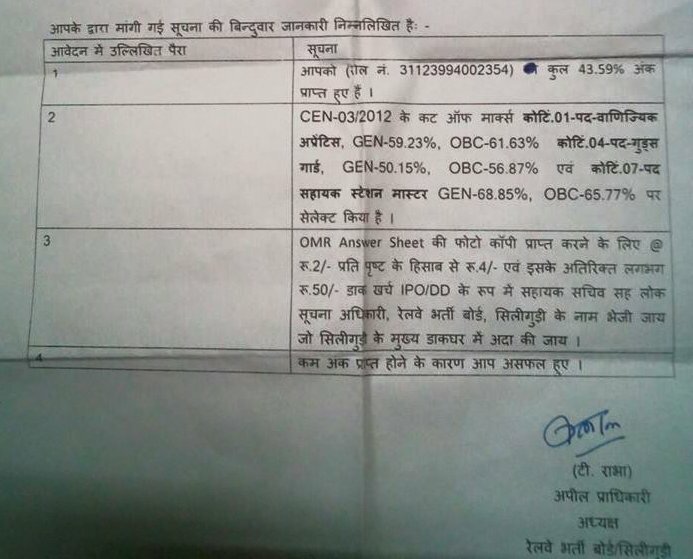 RRB NTPC Typing Test Details.